"The extensive works at Dale Hall (or Dale Hole, as it used to be written), founded in 1790 originally belonged to Joseph Stubbs - a successful manufacturer of earthenware during the 1822-5 period, who having retired from business, died in 1836. He was succeeded in about 1843 by Messrs. Thomas, John & Joshua Mayer....."
"It is sometimes considers the work of Joseph Stubbs to be variable in colour, quality and execution. Stubbs began the factory at Dale Hole in 1790, retired in 1829, and died in 1836. 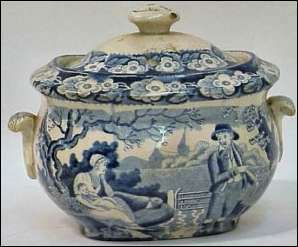 Upon his retirement, the factory was purchased by Mayer, long an occupant of one of England's oldest potteries at Clive Bank in Stoke-on-Trent. 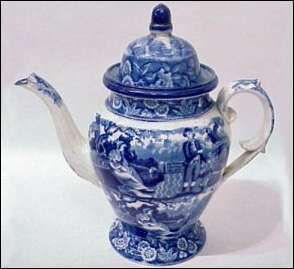 ..... much of the dark blue printed ware produced at J. Stubb's Dale Hall, Longport, factory between 1822 and 1835 was sent to America. Between 1828 and 1830 the firm was styled "Stubbs & Kent"
The directory entries for Joseph Stubbs [1822-35] overlap with Stubbs and Kent [1828-30] , Kent probably came into partnership with Stubbs for a few years. Ca. 1822-1833. Joseph Stubbs, Longport Staffordshire.